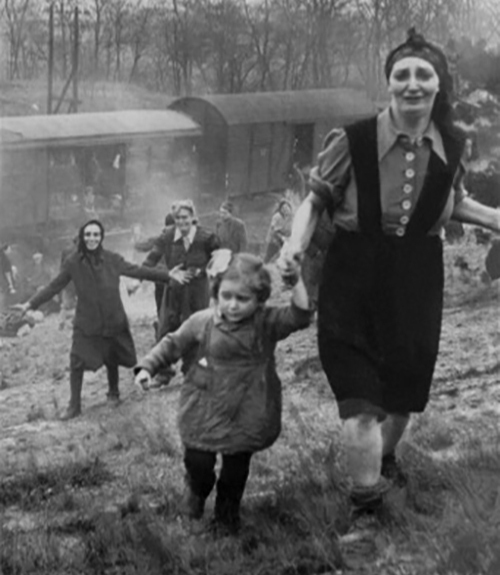 A female survivor and her child run up a hill after escaping from a train near Magdeburg and their liberation by American soldiers from the 743rd Tank Battalion and 30th Infantry Division. George Gross served as a tank commander with the 743rd Tank Battalion. On 'Friday, the 13th of April, 1945, led by their major scouting in a jeep, Tanks 12 and 13 of the 743rd Tank Battalion of the U.S. Army have just liberated a train transport with thousands of sick and emaciated victims of the Holocaust. Major Clarence L. Benjamin snaps the photograph at the moment of liberation. Tank 12 was commanded by Sgt. Carrol Walsh. Tank 13 was commanded by Sgt. George Gross. In 2001, Walsh was interviewed by USHMM teacher fellow Matthew Rozell, who was then directed to this photograph taken by the commanding officer and in the possession of George Gross, who had also taken several photographs of the liberation. Gross later became a professor of English literature at San Diego State University before passing away in 2009. Walsh retired as a New York State Supreme Court justice, passing away in information provided by Matthew Rozell.